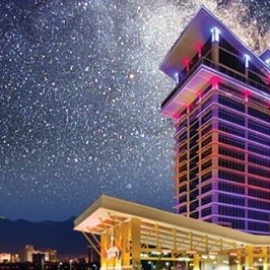 Eastside Cannery Casino & Hotel's exterior stands out among the skyline of the Boulder Highway. The most prominent feature of the property is the 16-story bronze hotel tower featuring an exposed structural and decorative element, which is topped off by a saw tooth roofline making it an icon for the Las Vegas Valley. There are an abundance of visual references to the burgeoning industrial era with the use of brick and steel in various aspects, along with cross-braced steel facades and heavy steel open trusses. Murals depicting building amenities in a fun and nostalgic way decorate the outer walls of the property. 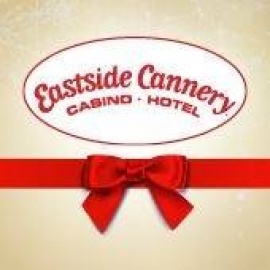 The interior of the Eastside Cannery Casino & Hotel is complementary to the exterior’s architectural design. Inside, guests are transported to the age of industry. Large open truss ceilings, exposed mechanical and over-scaled detailing is found throughout the property. There are elements of the past intermixed with hi-tech. The use of warm inviting earth tones accent the vibrant saturated colors of mustard, orange and avocado.